This has been such a ridiculous week, I am seriously having a difficult time figuring out how it’s Friday already. I wound up watching the game on Monday – staying up for it even, and then missing both Tuesday’s and Wednesday’s games because I fell asleep (Tuesday), and had another event to go to (Wednesday). I know that I missed two amazing games, but what I have lacked in viewership this week, I will try to make up for in actual presence at the park this weekend; I’ll be at the fireworks show tonight with some friends, and then on Monday afternoon, and none too soon, either, as it feels like forever since I’ve been to a Mariners game. I went to sleep early last night to be able to get up and get back to work early today, so I’m just going to post a few photos and get ready for what is shaping up to be a super long day, but it’s a Friday so I don’t mind. 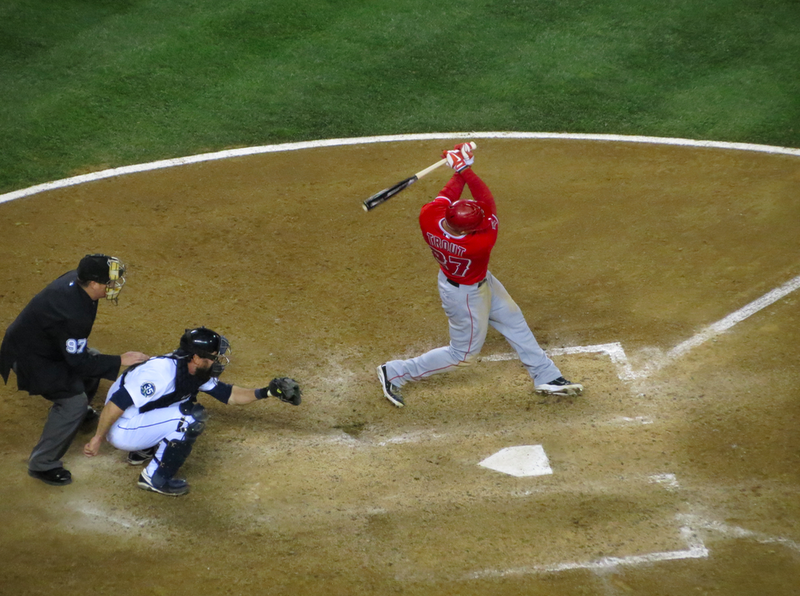 Mike Trout takes a hack at a Tom Wilhelmsen pitch. John Jaso is backstop. I miss Jaso, and wish he could have stayed, but I kept typing his name as “Jason”, so maybe it’s all for the best. Edgar’s Cantina before it was Edgar’s Upper. Though this was how it looked when I first started going to baseball games, it seems so weird that there were ever seats here. It seems even weirder that the space that is now Edgar’s Cantina was all enclosed and dark and depressing; nothing like it is now. I remember being wary of the new construction, wondering what they were going to do with the space that I spent so much time in in my early days; but now I can’t imagine it any other way. I hope that the people in the photo were able to come to a decent agreement with the organization about where their new seats would be located. I remember taking this picture and realizing that I’d never thought about how any season ticket holders might be affected by the removal of an entire section of seating. I’m sorry they replaced your seats with tacos, guys. 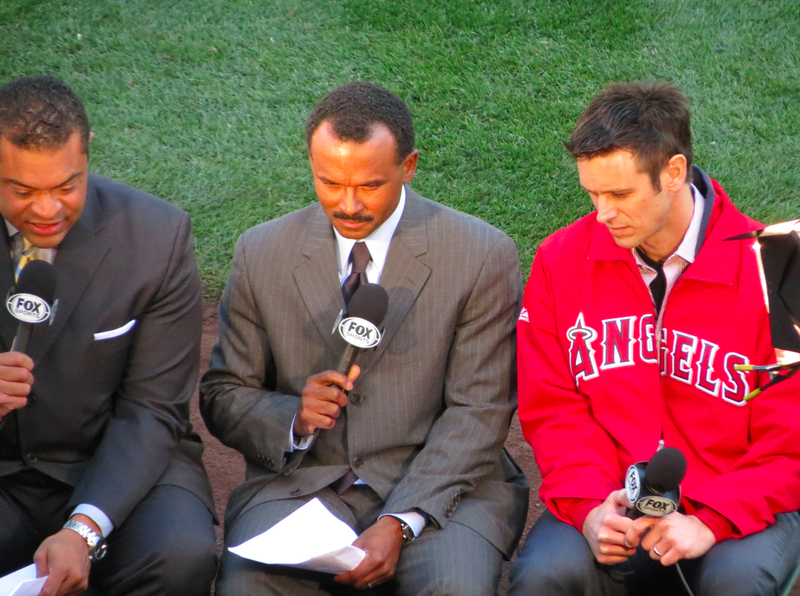 I remember taking this picture, and wondering who the player was in the jacket, and why he was wearing slacks; I figured it was a guy on the DL or something. Of course, I laugh at that now; just like I laugh at a lot of stuff my younger self thought about the game and the people involved in it. Some of that stuff is still true and accurate, but it’s funny how we evolve a hobby the more we take part in it. And yes, this picture was taken about 5 years ago, and Dipoto still looks exactly the same (as he did when he was a player, and probably will forever). The Mariners of today, meanwhile, are still impressive two months in, and I feel like I’m waiting for the other shoe to drop. This has to be too good to be true, doesn’t it? I mean, we’ve spent just about all month in first place. 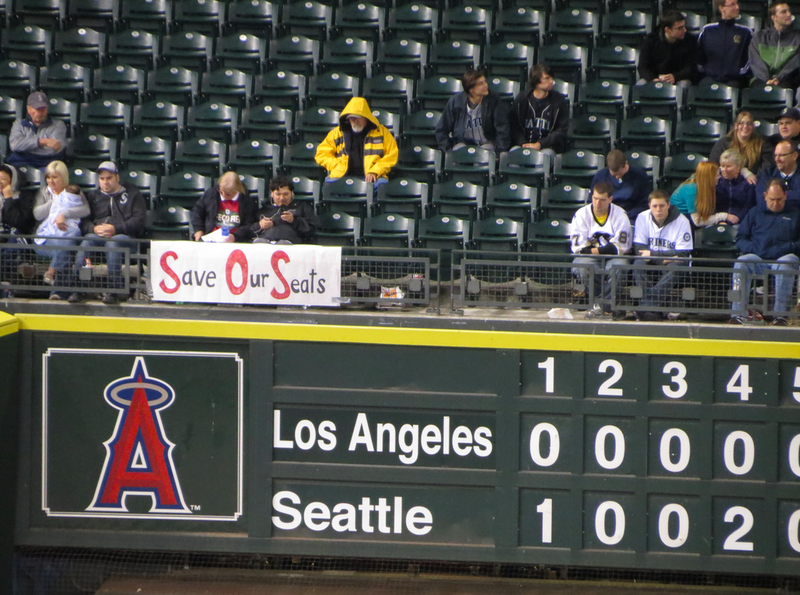 How does that even happen with Seattle baseball? Are we all suffering from some massive delusion, or has this really been happening? I mean, the Rangers are fighting, but our W-L record is .609; this puts us second only in the American League to the Boston Red Sox, who are at .617. The Texas Rangers are our biggest threat (in the West) currently, neck and neck with the Baltimore Orioles. The only other two teams doing better are the San Francisco Giants and Chicago Cubs. Wait, the Cubs?! Really?? I don’t know what kind of weird spell you’re trying to cast, Baseball, but keep it up. And with that, I have to get ready to go to a nice quiet office downtown. Happy Felix Day, everyone! See you at Safeco!